Poster GP writes in with his review of the flexible stands by Whippy Superpose, whose regular stands I’ve discussed previously on PGPoA. I’ve been trying for a LONG time to come up with some decent stands for the 6” DC and Marvel figures on my shelf. The peg hole only works so well, and all too often I’ll hear from the next room the sound of a heavy figure’s joints giving out and falling over. So it is only natural that I feel as if I owe a debt of gratitude to Poe. 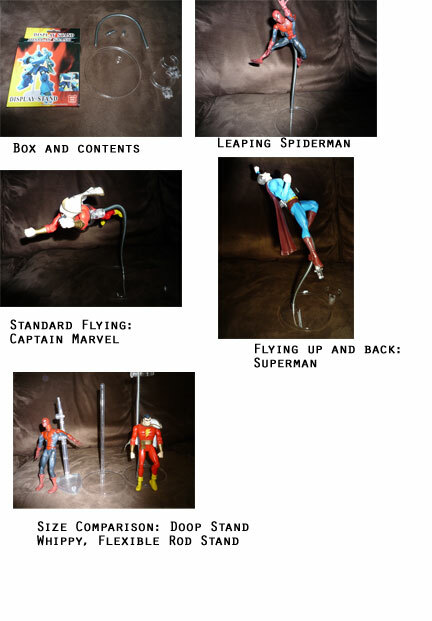 His “Stand!” blog entry is probably *THE* most comprehensive decent review of action figure stands. Without him, I wouldn’t have heard of the Whippy Superpose, I wouldn’t have gotten the idea of using the clamps on the Doop Stands, and I would be able to get the REM song “Stand” stuck in my head. 2 out of 3 ain’t bad. I could post this review on my own blog, but competing redundancies don’t benefit the community. Working together does. So here’s my altruistic payback for the great job Poe and other contributors do. When buying the Whippy Superpose on eBay, I noticed that the seller had another type of stand for sale. Labeled simply as “1/6 Action Figure – Stand,” the pictures showed a flexible metal post holding up a figure, but I had a feeling that more creative things be done with it….I included two in my order and they were here before too long, even though they came from Hong Kong. The box, simply labeled “Display Stand” is small and flat: wide enough to fit the base and slightly thicker than the base’s width. The brand name seems to be “Color Bear,” which is the same brand as the Whippy Superpose (which is just plain fun to say). Being the same brand, the base is the same as the Whippy’s, and the two clamps, small and large, are the same two screw clamps that come with the Whippy, so you get all the benefits (use with Doop Stands) and issues (break if you screw too tightly) that come with those. You screw the metal stave onto one end of the flexible metal rod (or “pliable pillar,” as it says on the back of the box), and now it can be plugged snugly into the base. It also comes with a metal cap to screw into the top, but I didn’t find it necessary to use. The rod is coated with plastic so it won’t scratch things up, and it does a pretty decent job of staying in place when you bend it. You can put the figure in a wide range of poses, but instead of having one or two joints which bend, you can twist it all over. The wide base helps to counter balance some of the more creative poses you may wish to do, but gravity is gravity, so you’ll need to be realistic. At $5.99 plus shipping and handling, the biggest drawback is that they’re slightly more expensive than some of the other options, and some may be turned off that unlike the Doop Stands, they’re not clear. But my only regret is that I didn’t buy more than two. Doop Stands aren’t that easy to come by in great shape, and these are taller and allow for some great poses. They’re a great product and combined with the other options, they’ll help make either a simple or an complex display better. Kinda confusing calling these Whippy Superpose if that's what the others are called too. I'm hereby redubbing these Super Whippypose stands. Begin adhering accordingly. These are great. I ordered a set of the regular WP stands last summer. It was a pain dealing with overseas so I contacted BBTS about carrying these. They seemed interested so I forward the contact info from my package to them. With Mattel only making enough stands to last 15-minutes we need alternatives! You'd think they'd sell quite a few of those and the regular whippys if they carried them, especially since they work with 12" figures as well. Yeah, they said stands do very well for them. I tried to rally the troops on Mattel's Facebook page to tell BBTS they want them, but, yeah, more important issues going on over there! I use the waist clips from the Whippys with a standard Doop stand. Works great, but I'm tempted to grab a few of these.